Happy Sat. friends - I wanted to share a quick tip or idea for those of you that are like me and you store your stamps in the clear stamp pockets, but don't like the idea of just throwing away the original packaging. I like to keep the packaging handy in case I decide to sell a stamp set, and I want to sell it to the potential buyer with its packaging that it came in. Some out there still store their stamps in the packaging. For a while, it took some getting use to not seeing the pretty packaging that the stamps come in like Lawn Fawn, Mama Elephant, etc in my storage container, but since I've fully converted to storing my stamps in the clear stamp storage pockets, I don't mind it now so much, but I still have the pretty package it came in. 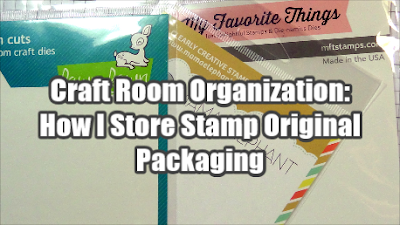 I have a video to share of just what I mean :) I'd love to hear if you keep the original packaging, or how you store your stamps, so please leave me a comment - I'd love to hear from you. Hope you all have a nice rest of your weekend. The Creative Chick 10th Blogiversary Celebration!